This satisfying mix of visual novel and dungeon crawler cuts like a knife, but it feels so right. Sure, dating humans is cool and all. But have you ever wondered what romancing weapons would be like? 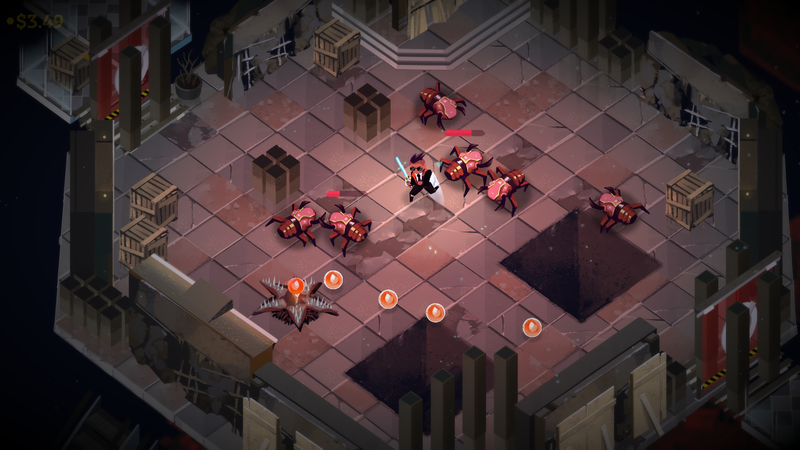 Kitfox Games' Boyfriend Dungeon answers that question quite nicely, serving up an intriguing amalgam of flirtatious advances, addictive combat, and super hot suitors. This unique action-RPG dungeon crawler combines the best parts of dating sims with your favorite fast-paced casual roguelike for an explosive end product. The game was on display at the Indie Megabooth during PAX West 2018, and I was able to sample a small slice of it that, much to my chagrin, was over much too quickly. The project's currently seeking funding via Kickstarter, and it's already smashed through its goal of $50,011 and is currently sitting at $151,478 with 11 days remaining. In short, it's exceeded expectations for the team, and it's clear people can't wait to get their hands on these potential suitors' hilts. At the beginning of the demo, I was able to edit my character's skin tone, eyes, hair color, and a smattering of other details before setting out into the world. I was given the choice between two characters: Valeria and Sunder, for the purpose of this demo. While Sunder the Talwar was dashing enough, I set my sights on Valeria the Dagger instead. Beginning at the "hub" area at the beginning of the demo where you could hang out in your room and edit your character or go through your phone was a nice touch. I particularly enjoyed the series of text message conversations with Valeria and Sunder, as well as my in-game mother. She was hilariously encouraging, and her messages were heartwarming to see. I enjoyed having some respite in my character's home and the cell phone segment was a nice added touch before heading out into the world. 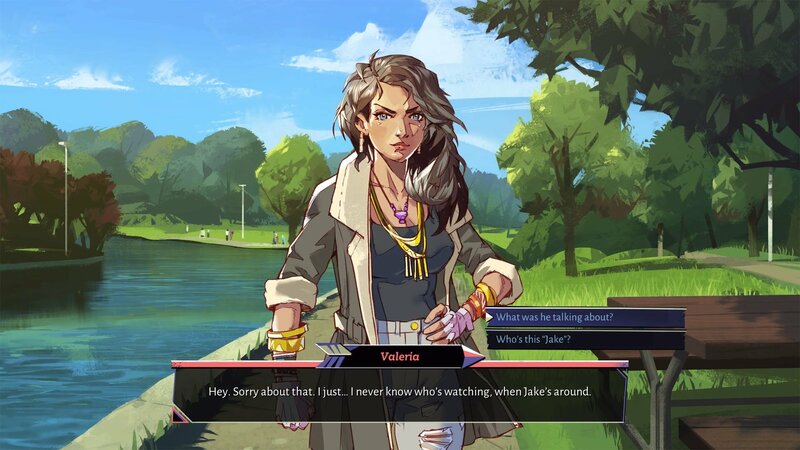 The visual novel scenes incorporate large, lush images of each character that accompany a series of dialogue options you can select from while chatting with them. My interlude with Valeria was short, but incredibly sweet as we flirted while out on a "real" date. She had apparently enlisted a friend to check up on her to make sure I wasn't some sort of dangerous customer, which was a fun and realistic touch. In fact, the only thing that made it feel a little less like a real-life fling was the fact that she was self-aware she was a weapon and so was I. And we were totally cool with it. If that's the part of the premise you think is going to really ruffle anyone's features, it's definitely not. Unfortunately, there wasn't really any sort of explanation as to what was going on with this plot point in the demo, which I'd like to know more about in the future. The most important thing was the fact that our date felt personal and riddled with real-life concerns, with playful advances toward each other flying left and right. I was definitely smitten at the end of it. You aren't limited to who or what you can date, either. There's a wide variety of characters with differing sexualities, including non-binary romance options as well as heterosexual partners, if that's what you're into. In short, if you see a total weapon babe you want to get with, well, you can totally do that. The weapons range from the lasersaber Seven to glaive Sawyer, and even the kitty named Pocket, but only Sunder and Valeria made an appearance in the painfully brief demo. There's a sixth character in the making as a Kickstarter goal right now that I'm hoping ends up making it into the game, but it hasn't happened just yet at the time of this preview. But while the dating sim elements are engaging as-is, Boyfriend Dungeon's "dunj" segments are equally engaging. You can select a dunj to head to thanks to the game's hub system, which I was able to test out following my first encounter and chat with Valeria. Exploration isn't anything new or groundbreaking, but it's constructed in a fresh and modern way that brings the mobile Steven Universe games to mind, especially when it comes to the art style. This is where the character you create at the beginning comes into play. The art style is dramatically different here, as it shifts from gorgeous potrraits to a more chibi-fied style for the dunj, with colorful environments rife with enemies, sliding doors, treasures, and bubble teas to heal you up. Each level of the dunj features a stronger set of enemies that you'll have to defeat with a series of powerful melee abilities. I wasn't privy to other viable attacks in the gameplay slice, but melee felt satisfying and more than powerful enough to clear each floor of a handful of enemies at the same time. Each lunge and strike shook multiple bad guys, and it was easy to become cocky since I was able to take on so many at the same time. The aforementioned bubble teas are dropped on the battlefield, and if you're at full health you can carry a handful with you to heal up and keep going after taking damage. I was only able to clear a few stages of the dungeon before I encountered what looked to be the final boss, or at the very least the final boss of that particular area. It approached me and I was at the ready, simply aching to reap the rewards of a hard-fought brawl between the behemoth and I. Unfortunately, just like that, the demo was over. Inevitably, I just wanted more, as I indicated to the developers – why'd it have to stop there? I was into it! Boyfriend Dungeon is looking to unleash its hotties with (super dangerous) bodies upon us in 2019, but I certainly hope I don't have to wait that much longer to see what it's like to hang out with suitors like Talwar, Valeria, and the adorable cat. Oh, yes. There's a cat you'll be able to vibe with, too. Believe me when I say this game has something for everyone...especially if you're only into weapons.